The Built Environment at Pine Mountain Settlement School refers to all architectural structures as well as any other physical plant structures, such as the reservoir, bridges, stone walls, disassembled log cabins, fountains, etc. , and any structure that requires manual intervention, such as the old Swimming Pool, Root Cellar, Smoke House and the Power House. The Native American habitation near the School entrance, known as the Indian Cliff Dwelling, is also described. 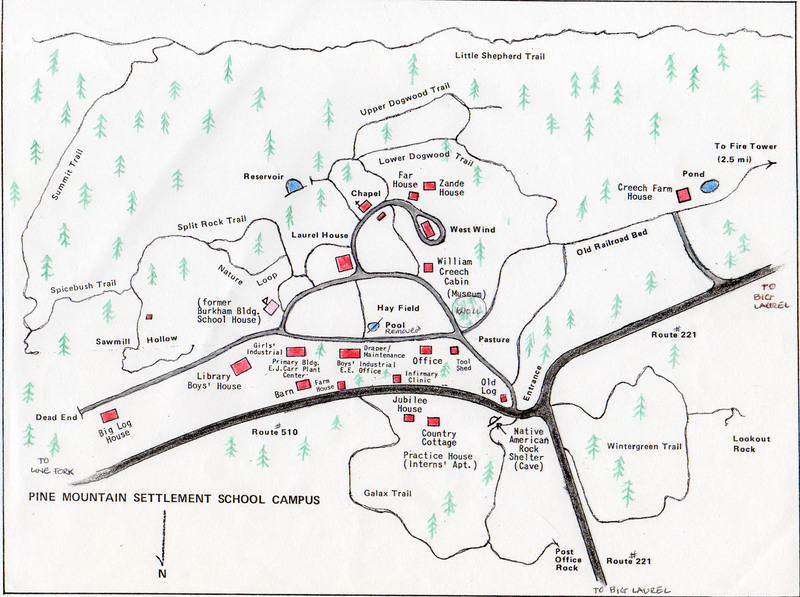 Maintained trails are also integral to the programs at the School and are shown in some of the maps of the School, particularly following the institution of the Environmental Education Program in 1972. The very early buildings on the campus were the essential institutional structures. These buildings included structures such as Old Log, Big Log, and Burkham School House, used to house students and/or staff and provide office space and educational space. Throughout the history of the School, many of the buildings were re-purposed as required by changes in programs or additions to or reductions in staff. Following the re-purposing, some of the buildings were re-named. For example, Big Log first held staff and students and later became the primary residence for Directors. Boy’s House was the primary residence for boys during the Boarding School years and later became the Library. Dormitory space for students was of primary concern as the School grew and as it accommodated an older population during the boarding high school years. For example, during the boarding school years, the campus grew rapidly under the direction of Glyn Morris (1931 – 1941) and there was an urgent need to look at housing for the growing student and staff population. Morris evaluated programs, student population and staffing and what new construction would be necessary to accommodate the needs of the School. Two new buildings, one for girls and one for boys, were designed by Mary Rockwell Hook, the School architect, to meet the growing need for housing. However, they were planned just on the cusp of an economic downturn in the school finances, a re-structure in county education and the departure of Morris in 1941. Only one of the designed buildings was constructed before the Boarding School closed in 1949. This was building was West Wind. 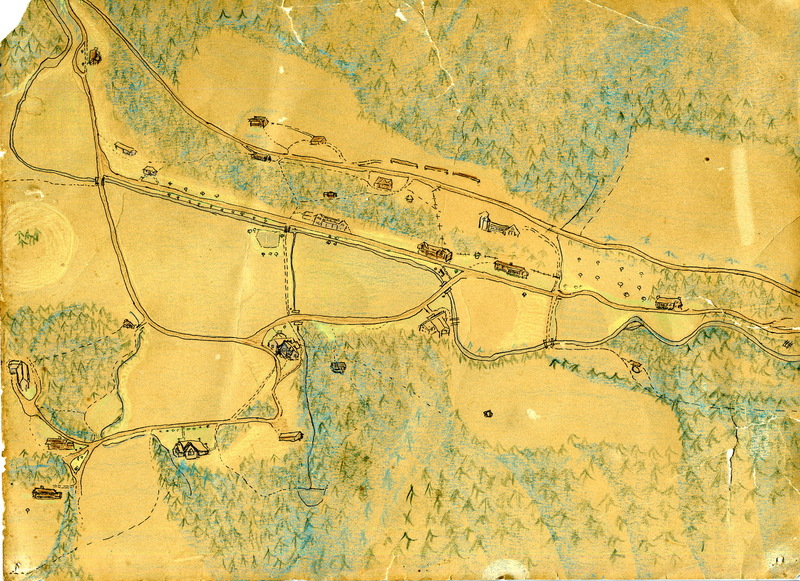 It seems agreed by the Board and Mr. Morris that a hundred boarding pupils is about the ideal number for Pine Mountain and that there is at present no intention of expanding beyond that, feeling that this is about the right number to conserve the quality and training tradition at Pine Mountain. It is also agreed that about twenty-five is the maximum number of boys or girls to live in one house, that a certain individual approach and a home atmosphere is apt to be sacrificed if the number exceeds that. It is, therefore, the plan to have eventually the two girls houses, each accommodating twenty-five located up on the ridge near Pole House and near the site of the present Far House. 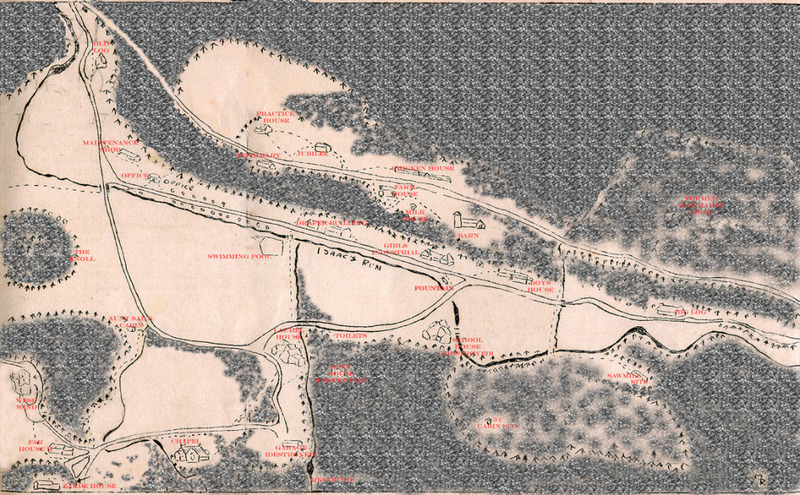 The second boy’s house to be placed in Saw Mill Hollow, thus concentrating the boys at the lower end of the school grounds, the girls at the upper, with Laurel House, School House, and Chapel, between. It is constantly kept in mind that any new buildings must be kept simple but practical, must be in keeping with the purpose of the school, and must be appropriate to the mountain setting, yet expressive of that distinct and artistic quality we all feel here. “Funds” was a key word. By 1940 the campus built environment was beginning to show its age and new structures in addition to maintenance on the older structures was taking its toll on capital funding. Further, the programs at the School following the closure of the boarding school did not demand continuous residency in dormitories. Today, as programming changes at the School, the demands on the built environment continue to change. The complex maintenance of some 23 existing structures remains of constant concern to the Board and to the Director who governs the day to day operation of the institution. As the built environment continues to age, the maintenance demands continue to eclipse the ability to design and build new structures that would be more accommodating of new programming. Today, the delicate dance between attention to the historical importance of the built environment of the School and the need to focus attention on current and future programming for the institution is demanding increased attention from the Director, from all staff who work at the School and the Board of Trustees who monitor the health and sustainability of the institution and its built environment. Pine Mountain was placed on the National Register of Historic Landmarks in 1993, an honor that expanded the base of concern for the built environment of this unique rural settlement school to one of national importance. This designation is an honor and one that comes with responsibility. Pine Mountain has been a good steward of the designation to the extent that its funding can keep pace with the maintenance needs. 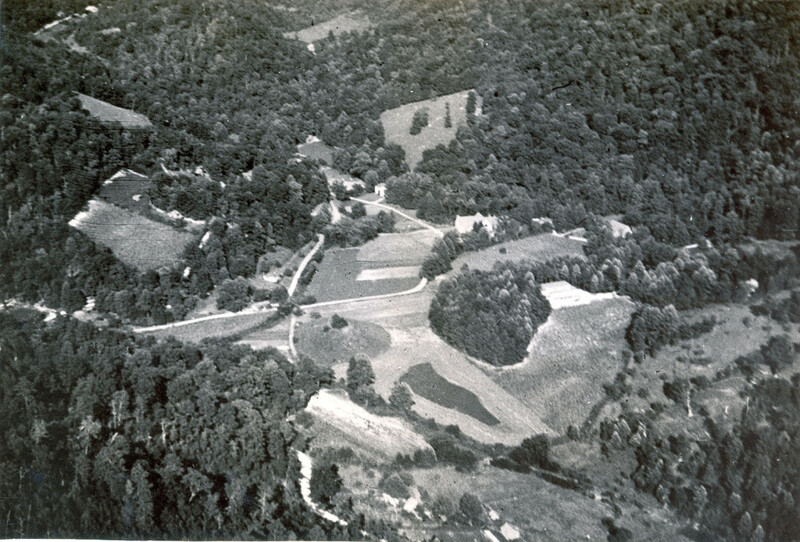 As a National Register of Historic Landmarks site, Pine Mountain is an asset to the local area and to the state of Kentucky. Barn (1915) “Designed by Ethel de Long on the suggestions of three architects.” Housed dairy herd, equipment. Milk House adjacent to barn. Silo removed c.1952-3. Boys House [Library] (1919) Remodelled to house Library in 1959. Remodeled for EE Exhibition and instruction 1973. Remodeled for Gift Shop Room, 1996, again in 2017. Archive move completed in 2018. Cafe installed, 2018. Chapel (1922-24) Designed by Mary Rockwell Hook with adjustments made by Luigi Zande to stone-work of an interior arch. Creech Cabin (1870) Original home of William and Sally Creech. Moved to site in 1926. Moved again near campus original site and restored in 1990. Far House II (1997) Pre-cut log structure constructed on site of original Far House I. Stone terrace was preserved. Farm House (1916-1917) Building enlarged in 1918. Student dwelling and later staff dwelling. 2017 guest lodging. Gas Pump (c. 1930) Tank removal 1998. Girl’s Industrial [Plant Center] (1921 ?) Designed by Mary Rockwell Hook [? ], possibly Luigi Zande, to complement early Boy’s Industrial (destroyed by fire) Home Economics classes, Industrial training. Weaving and sewing room. Print shop. Primary school classrooms. Later EE classroom (Plant Center and E. J. Carr Colletion]. Infirmary [Clinic] (1921) Designed by Mary Rockwell Hook. Wings added in 1929. Use included hospital and clinic, staff residence and 2010 guest lodging. Jubilee House (1941) Built with Silver Jubilee funds for doctor residence. Staff housing. Laurel House (1940) Designed by Mary Rockwell Hook to replace her original Laurel House I (1914) which burned in 1940. Kitchen and central dining space, staff apartments. Co-op store. Meeting space. Later Guest lodging. Office (1919) Designed by Mary Rockwell Hook and adjusted by Ethel de Long and Luigi Zande. Bathroom added 1955. Tool Shed II (1951) Built by Quaker Summer Camp and staff. Replaced earlier (1914) stone tool house. West Wind (1941) Designed by Mary Rockwell Hook with an original flat roof. Roofline changed in late 1940s. (1946?) Planned as Giorl’s Dormitory. Hospital from 1949 to mid-1950s. Guest lodging. Zande House (1917-1918) Designed and built by Luigi Zande, for new wife, Ethel de Long Zande, co-founder of school. Remodeled in 1983. Sold to School following death of Ethel de Long in 1928. Staff residence and later guest housing. Pine Mountain Settlement School Historical Collections. Pine Mountain Settlement School, Pine Mountain, KY.
Pine Mountain Settlement School Historical Collections. 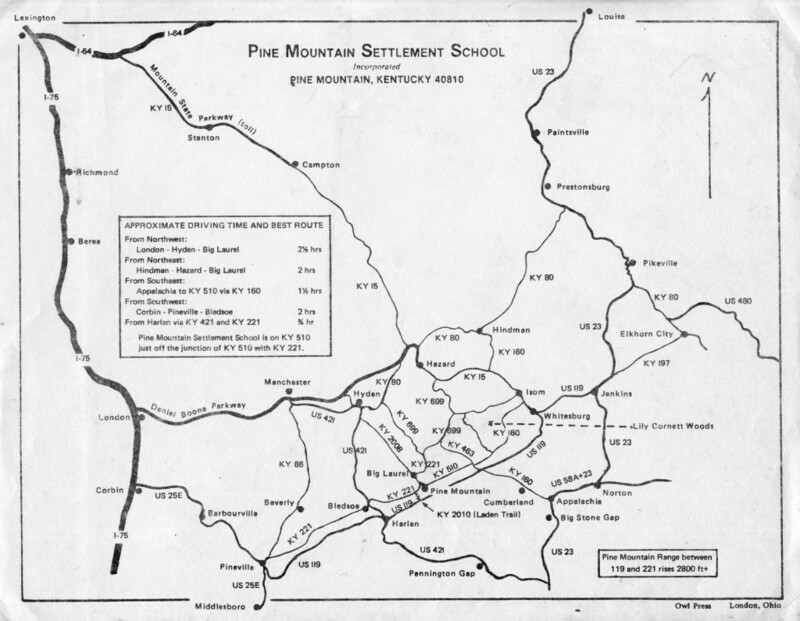 Pine Mountain Settlement School, Pine Mountain, KY. Archival material.